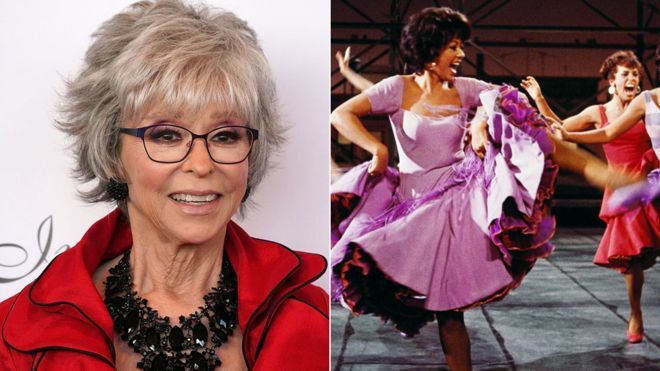 Emmy, Grammy, Oscar and Tony Award recipient Rita Moreno returns to the silver screen in two new guises as part of Steven Spielberg's upcoming WEST SIDE STORY reboot, as both actress (in a new role) and executive producer, revealing candid opinions of the early drafts of the new screenplay. As part of a conversation on SirusXM this weekend, Moreno expressed her dissatisfaction with the Spanish being utilized in the new Tony Kushner-penned adaptation of the iconic Leonard Bernstein/Stephen Sondheim/Arthur Laurents musical classic. "I've only read a very, very rough script of the script - and it's very rough, meaning that there's tons of stuff that's going to be changed. For instance, Tony [Kushner] did the Spanish parts with his dictionary Spanish, which was horrific!" Moreno says with a laugh. Moreno continues, "I didn't know how to say that to Steven [Spielberg], and, finally, in our conversation on the phone... I said, 'Listen, Steven, I don't know if you are aware of this, but the Spanish in the script is not, not terrific.' And, he said, 'Oh, no, no, no... that's Tony Kushner using his Spanish dictionary." Optimistically, Moreno concludes, "I was very nervous that Steven would think that that was the correct thing; not at all." Joining Ansel Elgort as Tony will be 17-year-old newcomer Rachel Zegler as Maria, SUMMER: THE DONNA SUMMER MUSICAL Tony Award nominee Ariana DeBose as Anita, BILLY ELLIOT: THE MUSICAL Tony Award winner David Alvarez as Bernardo and HAMILTON's Josh Andres Rivera as Chino. Additionally, Moreno will appear as new character, Valentina, an expanded version of the role of Doc. WEST SIDE STORY begins filming this summer in New York City. No release date has been announced at this time.